NATHAN BEFFIE, son of ELIAS WOLFF and JOSÉPHINE SOESTER.was born 11 April 1887 in Amsterdam, Holland, and died 24 December 1944 in Bergen-Belsen concentration camp, Germany. 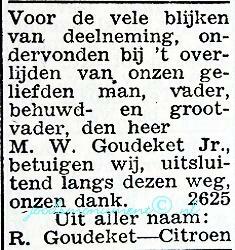 He married BERTHA GOUDEKET 11 April 1918 in Amsterdam, Holland, daughter of MOZES GOUDEKET and GEERTRUIDA WARREDIJN. She was born 12 December 1888 in Almelo, Overijssel, Holland, and died 04 April 1945 in Bergen-Belsen concentration camp, Germany. Are you related to Nathan Beffie? Resided with family February 1941: Van Breestraat 171, Amsterdam, Holland. The Jokos file reveals that a claim was lodged for compensation for looted jewellery (S-claim, number 2/429). Parents of Bertha Goudeket were MOZES GOUDEKET born 28 September 1860 in Amsterdam, Holland, and died 16 April 1942 in Amsterdam, Holland and GEERTRUIDA WARREDIJN. He married (1) GEERTRUIDA WARREDIJN 02 June 1887 in Amsterdam, Holland. She was born 05 August 1866 in Amsterdam, Holland, and died 08 November 1920 in Amsterdam, Holland. He married (2) ROSETTE CITROEN 20 August 1929 in Amsterdam, Holland. She was born 10 July 1882 in Amsterdam, Holland, and died 04 June 1943 in Sobibor death camp, Poland - Holocaust victim. Mozes Goudeket was the son of Wolf Goudeket and Betje Spijer. He was a well to do diamond worker and had been married to Geertuida Warradijn, who died in 1920. The couple had three children. Later Mozes was married to Rosette Citroen. They lived at 29 Amstellaan in Amsterdam, Holland. The marriage between Mozes and Rosette was based on a prenuptial agreement without any community of goods. The Jokos file reveals that a claim was lodged for compensation for looted securities or bonds. (W-claim, number C22-23; O31; C41; C44; C56; C57; C172/173; C176; C178-179; C75-76; C78; C103; C100; Osp17; O11; A2; C158; C160/729). 1. BERTHA GOUDEKET, b. 12 December 1888, Almelo, Overijssel, Holland; d. 04 April 1945, Bergen-Belsen concentration camp, Germany. 2. JULIETTE HENRIETTE GOUDEKET, b. 12 July 1891, Almelo, Overijssel, Holland; d. 14 January 1985, Los Angeles, California, USA; m. HAROLD GRIEVE, 1930, USA; b. 01 February 1901, Los Angeles, California, USA; d. 03 November 1993, Los Angeles, California, USA. Later to become a Hollywood actress known as Jetta Goudal. In 1918 Juliette Goudeket left World War I-era devastated Europe to settle in New York City, the United States where she hid her Dutch and Jewish ancestry, generally describing herself as a "Parisienne" and on an information sheet for the Paramount Public Department she wrote that she was born at Versailles on July 12, 1901 (shaving 10 years off her age as well), the daughter of a fictional Maurice Guillaume Goudal, a lawyer. Burial: Great Mausoleum, Sanctuary of the Angels, Forest Lawn Memorial Park Cemetery, Glendale, California, USA. 1. EDUARD BEFFIE, b. 12 June 1919, Amsterdam, Holland; d. 09 July 1943, Sobibor death camp, Poland - Holocaust victim; m. PAULINA SARA VAN GELDER; b. 28 November 1920, Amsterdam, Holland; d. 17 September 1943, Auschwitz concentration camp, Oswiecim Poland – Holocaust victim. Eduard Beffie and Paulina Sara van Gelder, both office clerks had given notice of their intended marriage. Before the wedding could take place, one of them was deported. Resided February 1941: Joh. Verhulststraat 200 bovenhuis, Amsterdam, Holland. 2. GEERTRUIDA BEFFIE was born 19 April 1922 in Amsterdam, Holland, and died April 2013 in New York, USA. She married FRITS ZEEHANDELAAR 1947. Having to find a great deal of money, Geertruida Beffie`s parents managed to arrange for her to travel to Southwestern France via Paris in the fall of 1941. Accompanying 3 small children. Geertruida succeeded in escaping to Spain from where she fled to Cuba and later to New York in the United States. Geertruida Zeehandelaar (born Beffie) grew up in a middle class family in Amsterdam, Holland. She had one older brother. During the 1930s the family had endured difficult financial circumstances, which meant attending a college for Geertruida was unaffordable and instead completed a two-year Schoevers Education that was a privately owned educational institution in the Netherlands, which mostly trained students for secretarial and administrative positions. As a young girl Geertruida Beffie enjoyed to read, loved music and dance but hated sports. 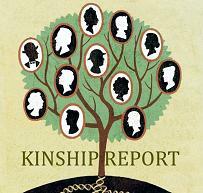 She described herself as a tough, independent child who received regular punishments for insubordination.. In 1941 Geertruida had knowledge of what was to be the fate of the Jews under the German Nazi regime and with help from the Dutch underground she escaped Holland through France, via Spain, Cuba, her final destination fleeing into the United States. Throughout the remainder of the war she worked at sea for a Dutch Shipping Company. 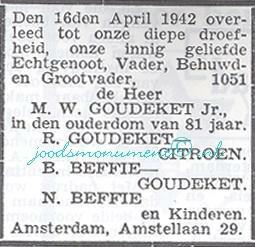 In 1947 Geertruida Beffie married the Dutchman Frits Zeehandelaar, also Jewish, who escaped the Netherlands during the German Nazi occupation and also settled in America after the war. Together they had been married 51 years. It was only a few years prior to her death in April 2013 that Geertruida discovered her brother, Eduard Beffie had been murdered in Sobibor and both her parents perished in Bergen-Belsen, finding the thought distressing of her dead mother who died of typhus, lying on a shelf just before the liberation of the camp. Geertruida Beffie said; "I am a co-plantiff, because I owe it to my brother"
SOPHIA BEER was born 04 November 1879 in Amsterdam, Holland, and died 23 July 1943 in Sobibor death camp, Poland - Holocaust victim. She married ALEXANDER COHEN 12 November 1901 in Amsterdam, Holland. He was born 25 June 1874 in Arnhem, Holland, and died 14 May 1940. 1. ERNST PAUL COHEN, b. 23 March 1904, Amsterdam, Holland; d. 21 September 1944, Manila Bay, Philippines; m. ANNIE RABBIE, 29 September 1936, Amsterdam, Holland; b. 05 March 1913, Watergraafsmeer, Amsterdam, Holland; d. New York, USA. Residence: 1 Christopher St, New York, USA. On September 29, 1936, Ernst Cohen married Annie Sarah Rabbie, born March 05, 1913 in Watergraafsmeer, Amsterdam, Holland. Her parents were Jacob Rabbie and Sarah Beffie. Jacob Rabbie was Deputy Director of the Rotterdam Bank in the Dutch East Indies. In 1938 Ernst Cohen was a sales representative of the fragrance factory NV Polak & Schwarz based in Amsterdam, Holland. Ernst Cohen`s mother, Sophia Beer was a cousin of Loes Pop, wife of the third director of Polak & Schwarz. Ernst Cohen was the youngest of two children from publisher Alexander Ezechil Cohen and Sophia Beer. The family lived on the Keizersgracht 320 and later in the Den Textraat 36 in Amsterdam, Holland. The Red Cross reported to the Polak & Schwarz company that Ernst Cohen at the outbreak of the war was in Palestine. From there he went to the Dutch East Indies where Polak & Schwarz had an office in Batavia, Java, Indonesia. Ernst's wife was also in the Dutch East Indies during that time. After the Japanese attack on the U.S. navy (Pearl Harbour, 7 December 1941), the Netherlands declared war on Japan and called the Governor General to mobilization. Ernst was conscripted into the Dutch army and became a soldier in the Royal Dutch East Indies Army (KNIL). Later, Ernst Cohen was captured during battle by the Japanese army, held prisoner and transported to a POW camp in Singapore. His wife was interned in a concentration camp in Java. In early September 1944, Ernst was placed on a small Japanese freighter, the Toyofuku Maru. It sailed from Singapore via Thailand to Japan and transported 1,200 English and Dutch prisoners of war. It was one of the eleven so-called Hell Ships, barges full of Japanese prisoners of war named 'Maru' wore. In Manila, Philippines the sick and dying were brought ashore. On 21 September, 1944 the Toyofuku Maru was torpedoed by American bombers and sunk. It was later claimed that the ship was not recognizable as a passenger vessel. There were only 200 survivors, Ernst Cohen was not among them. Wife Annie Rabbie was hospitalized and survived the war. She returned after the war to the Netherlands and was admitted into the Jewish Central hospital where she was nursed back to health. After her recovery she immigrated to New York, USA where she joined with her parents and sister Elly. The Toyofuku Maru: was used for carrying prisoners and troops to Japan. On 21st of September 1944 The Toyofuku Maru was sunk by aircraft off Luzon. Carrying British and Dutch POWs, she was hit by US torpedo carrying bombers and called in at Manila to unload the sick and dying. The Toyofuku Maru then resumed course and was hit again after three days at sea and sunk within minutes. 1000 prisoners lost their lives, only two hundred survived. LOTJE SUSAN was born 14 March 1827 in Amsterdam, Holland, and died 13 June 1888 in Amsterdam, Holland. She married ISAAC JAS 14 September 1853 in Amsterdam, Holland, son of ABRAHAM JAS and CLAARTJE FRIDMAN. He was born 11 May 1825 in Amsterdam, Holland. How are you related to Lotje Susan? 1. LEVENLOOS JAS, b. 21 October 1853, Amsterdam, Holland; d. 21 October 1853, Amsterdam, Holland. 2. MATJE JAS, b. 21 October 1853, Amsterdam, Holland; d. 25 October 1853, Amsterdam, Holland. 3. ABRAHAM JAS, b. 25 November 1854, Amsterdam, Holland; d. 09 April 1943, Sobibor death camp, Poland - Holocaust victim. 4. JOEL JAS, b. 07 May 1856, Amsterdam, Holland; d. 27 April 1921, Amsterdam, Holland. 5. RACHEL JAS, b. 19 December 1857, Amsterdam, Holland; d. 15 June 1858, Amsterdam, Holland. 6. MOZES JAS, b. 21 February 1859, Amsterdam, Holland. 7. CLARA JAS, b. 16 April 1861, Amsterdam, Holland; d. 12 January 1862, Amsterdam, Holland. 8. MARTHA JAS, b. 06 May 1864, Amsterdam, Holland; d. 10 March 1869, Amsterdam, Holland. 9. ESTHER JAS, b. 27 November 1866, Amsterdam, Holland; d. 03 February 1929, Amsterdam, Holland. 10. JANSJE JAS, b. 05 July 1870, Amsterdam, Holland; d. 23 December 1870, Amsterdam, Holland. ABRAHAM JAS was born 25 November 1854 in Amsterdam, Holland, and died 09 April 1943 in Sobibor death camp, Poland - Holocaust victim. He married JUDITH STODEL 25 January 1885 in Amsterdam, Holland, daughter of JACOB STODEL and SAARTJE GLASSLIJPER. She was born 05 February 1855 in Amsterdam, Holland, and died 30 January 1934 in Amsterdam, Holland. Resided with family: Vrolikstraat 36 I, Amsterdam, Holland. 1. LOTJE JAS, b. 17 October 1879, Amsterdam, Holland. 2. NAATJE JAS, b. 10 December 1880, Amsterdam, Holland; d. 21 October 1893, Amsterdam, Holland. 3. ISAAC JAS, b. 10 July 1882, Amsterdam, Holland; d. 19 November 1942, Auschwitz concentration camp, Oswiecim Poland – Holocaust victim. 4. JACOB JAS, b. 07 December 1883, Amsterdam, Holland; d. 1912. 5. JOEL JAS, b. 22 June 1885, Amsterdam, Holland; d. 12 October 1942, Auschwitz concentration camp, Oswiecim Poland – Holocaust victim. 6. JOSEPH JAS, b. 22 August 1886, Amsterdam, Holland; d. 08 October 1942, Auschwitz concentration camp, Oswiecim Poland – Holocaust victim; m. SAARTJE COHEN, 29 October 1913, Amsterdam, Holland; b. 15 January 1883, Amsterdam, Holland; d. 08 October 1942, Auschwitz concentration camp, Oswiecim Poland – Holocaust victim. Resided with family February 1941: Retiefstraat 56 II, Amsterdam, Holland. Abraham Jas, Samson Jas and Izaac Jas, sons of Jacob Jas (deceased) and Saartje Cohen, are recognised as the children of the couple. Residence: Retiefstraat 56, 2nd floor, Amsterdam, Holland. 7. SAARTJE JAS, b. 04 May 1888, Amsterdam, Holland; d. 15 December 1942, Auschwitz concentration camp, Oswiecim Poland – Holocaust victim. 8. MOZES JAS, b. 25 July 1889, Amsterdam, Holland; d. 22 October 1942, Auschwitz concentration camp, Oswiecim Poland – Holocaust victim. 9. ESTHER JAS, b. 05 October 1892, Amsterdam, Holland; d. 15 December 1942, Auschwitz concentration camp, Oswiecim Poland – Holocaust victim. 10. MIETJE JAS, b. 30 March 1895, Amsterdam, Holland; d. 11 June 1895, Amsterdam, Holland. 11. KAREL JAS, b. 29 June 1897, Amsterdam, Holland; d. 16 July 1943, Sobibor death camp, Poland - Holocaust victim. 12. NAATJE JAS, b. 18 December 1899, Amsterdam, Holland; d. 31 January 1944, Auschwitz concentration camp, Oswiecim Poland – Holocaust victim. JOEL JAS was born 07 May 1856 in Amsterdam, Holland, and died 27 April 1921 in Amsterdam, Holland. He married ROSETTE SCHARLEWIE 11 June 1879 in Amsterdam, Holland, daughter of TOBIAS SCHARLEWIE and KLAARTJE WIENER. She was born 06 February 1853 in Zaandijk, Holland, and died 02 September 1923 in Amsterdam, Holland. 1. LEVENLOOS JAS, b. 22 February 1881, Amsterdam, Holland; d. 22 February 1881, Amsterdam, Holland. 2. LEVENLOOS JAS, b. 04 April 1882, Amsterdam, Holland. 3. ISAÄC JAS, b. 11 October 1883, Amsterdam, Holland; d. 21 July 1943, Sobibor death camp, Poland - Holocaust victim; m. SARA BEEK, 03 September 1913, Amsterdam, Holland; b. 22 March 1884, Rotterdam, Holland; d. 21 July 1943, Sobibor death camp, Poland - Holocaust victim. Resided with wife February 1941: Laing's Nekstraat 58 huis, Amsterdam, Holland. 4. TOBIAS JAS, b. 20 November 1884, Amsterdam, Holland. 5. ABRAHAM JAS, b. 05 March 1886, Amsterdam, Holland; d. 26 March 1943, Sobibor death camp, Poland - Holocaust victim. 6. CLARA JAS, b. 03 December 1887, Amsterdam, Holland; d. 1936, Amsterdam, Holland. 7. MOZES JAS, b. 12 June 1890, Amsterdam, Holland; d. 19 November 1942, Auschwitz concentration camp, Poland - Holocaust victim. 8. LEENTJE JAS, b. 09 September 1892, Amsterdam, Holland; d. 22 March 1970, Amsterdam, Holland. 9. SALOMON JAS, b. 28 December 1895, Amsterdam, Holland. 10. SALOMON JAS, b. 23 October 1899, Amsterdam, Holland; d. 28 May 1943, Sobibor death camp, Poland - Holocaust victim; m. JANSJE DE JONG, -20 June 1923, Amsterdam, Holland; b. 11 February 1899, Amsterdam, Holland; d. 28 May 1943, Sobibor death camp, Poland - Holocaust victim. Resided with wife February 1941: Sint Antoniesbreestraat 23 II, Amsterdam, Holland. ESTHER JAS was born 27 November 1866 in Amsterdam, Holland, and died 03 February 1929 in Amsterdam, Holland. She married HEIMAN DE VRIES 17 December 1890 in Amsterdam, Holland, son of BENJAMIN DE VRIES and MIETJE SLUIS. He was born 25 July 1868 in Hoorn, Holland, and died 15 June 1923 in Amsterdam, Holland. 1. LEENTJE DE VRIES, b. 28 November 1891, Amsterdam, Holland; d. 17 September 1942, Auschwitz concentration camp, Oswiecim Poland – Holocaust victim; m. BENJAMIN COUZIJN, 28 June 1916, Amsterdam, Holland; b. 19 May 1891, Amsterdam, Holland; d. 22 September 1942, Auschwitz concentration camp, Oswiecim Poland – Holocaust victim. Resided with wife February 1941: Amstellaan 49 huis, Amsterdam, Holland. LOTJE JAS was born 17 October 1879 in Amsterdam, Holland. She married GOMPEL BLOG 03 June 1907 in Amsterdam, Holland, son of WOLF BLOG and REINTJE PRESSER. He was born 08 July 1880 in Amsterdam, Holland, and died 09 April 1943 in Sobibor death camp, Poland - Holocaust victim. 1. NAATJE BLOG, b. 15 December 1899, Amsterdam, Holland. 2. ABRAHAM BLOG, b. 28 September 1903, Amsterdam, Holland. 3. WOLF BLOG, b. 05 October 1906, Amsterdam, Holland. 4. JUDITH BLOG, b. 23 July 1916, Amsterdam, Holland; d. 09 July 1943, Sobibor death camp, Poland - Holocaust victim; m. MARCUS HAAG; b. 25 June 1916, Amsterdam, Holland; d. 09 July 1943, Sobibor death camp, Poland - Holocaust victim. Residence: Pl. Muidergracht 73, 3rd floor, Amsterdam, Holland. ISAAC JAS was born 10 July 1882 in Amsterdam, Holland, and died 19 November 1942 in Auschwitz concentration camp, Oswiecim Poland – Holocaust victim. He married EVA BUITENKANT 23 August 1906 in Amsterdam, Holland, daughter of DAVID BUITENKANT and ESTHER ROOS. She was born 01 December 1883 in Amsterdam, Holland, and died 09 April 1943 in Sobibor death camp, Poland - Holocaust victim. Resided with family February 1941: Iepenplein 13 III, Amsterdam, Holland. Occupation: Rag peddler - rag and bone man. The Jokos file reveals that a claim was lodged for compensation for valuables surrendered to the Lippmann-Rosenthal looting bank (L-claim, number 5753/4034). Residence: Lepenplein 15, 3rd floor, Amsterdam, Holland. 1. JUDITH JAS, b. 12 October 1909, Amsterdam, Holland; d. 30 September 1942, Auschwitz concentration camp, Oswiecim Poland – Holocaust victim. 2. ESTHER JAS, b. 20 April 1912, Amsterdam, Holland; d. 28 June 1943, Sobibor death camp, Poland - Holocaust victim; m. ? POLAK. JACOB JAS was born 07 December 1883 in Amsterdam, Holland, and died 1912. He married SAARTJE COHEN 08 August 1907 in Amsterdam, Holland, daughter of SAMSON COHEN and MAARTJE WATERMAN. She was born 15 January 1883 in Amsterdam, Holland, and died 08 October 1942 in Auschwitz concentration camp, Oswiecim Poland – Holocaust victim. 1. ABRAHAM JAS, b. 02 November 1907, Amsterdam, Holland; d. 23 July 1943, Sobibor death camp, Poland - Holocaust victim. 2. SAMSON JAS, b. 15 November 1908, Amsterdam, Holland. 3. ISAAC JAS, b. 29 March 1910, Amsterdam, Holland; d. 31 May 1944, Auschwitz concentration camp, Poland - Holocaust victim. JOEL JAS was born 22 June 1885 in Amsterdam, Holland, and died 12 October 1942 in Auschwitz concentration camp, Oswiecim Poland – Holocaust victim. He married ANNA VAN KLEEF 28 July 1911 in Amsterdam, Holland, daughter of JOSEPH VAN KLEEF and MIETJE STODEL. She was born 02 December 1881 in Amsterdam, Holland, and died 12 October 1942 in Auschwitz concentration camp, Oswiecim Poland – Holocaust victim. Resided with family February 1941: Spitskopstraat 7 II, Amsterdam, Holland. Residence: Spitskopstraat 7, 2nd floor, Amsterdam, Holland. 1. JOSEPH JAS, b. 30 April 1912, Amsterdam, Holland; d. 29 April 1945, Bergen-Belsen concentration camp, Germany. 2. ABRAHAM JAS, b. 28 September 1916, Amsterdam, Holland; d. 16 July 1943, Sobibor death camp, Poland - Holocaust victim. 3. MIETJE JAS, b. 09 April 1918, Amsterdam, Holland; d. 16 July 1943, Sobibor death camp, Poland - Holocaust victim; m. LOUIS VAN MAARSEN, 17 July 1942, Amsterdam, Holland; b. 30 September 1917, Amsterdam, Holland; d. 16 July 1943, Sobibor death camp, Poland - Holocaust victim. SAARTJE JAS was born 04 May 1888 in Amsterdam, Holland, and died 15 December 1942 in Auschwitz concentration camp, Oswiecim Poland – Holocaust victim. She married ALEXANDER GOUDEKKETING 02 November 1910 in Amsterdam, Holland, son of BENJAMIN GOUDEKETTING and MIETJE TEEBOOM. He was born 23 April 1888 in Amsterdam, Holland, and died 22 October 1942 in Auschwitz concentration camp, Oswiecim Poland – Holocaust victim. Resided with family February 1941: Retiefstraat 58 huis, Amsterdam, Holland. 1. BENJAMIN GOUDEKETTING, b. 20 January 1911, Amsterdam, Holland; d. 02 April 1943, Sobibor death camp, Poland - Holocaust victim. MOZES JAS was born 25 July 1889 in Amsterdam, Holland, and died 22 October 1942 in Auschwitz concentration camp, Oswiecim Poland – Holocaust victim. He married VOGELTJE DE SWARTE 24 January 1917 in Amsterdam, Holland, daughter of RUBEN DE SWARTE and ?. She was born 13 April 1889 in Amsterdam, Holland, and died 25 January 1943 in Auschwitz concentration camp, Oswiecim Poland – Holocaust victim. Resided with family February 1941: Retiefstraat 82 II, Amsterdam, Holland. Belonging to: Mozes Jas and his family, Amsterdam, Holland. Room: lace curtain (2), drape (2), oil painting (4), wall clock, mirror clock, vase (2), standing table lamp, chair (3), armchairs (3), table with cloth, stove, divan with cover, sideboard with ceramics, glass set, worthless items, carpet, foot mat, floor cloth. Room: lace curtain, drape hanging, lamp, single bed with bedding and blanket (2), cabinet with knick-knacks, cupboard with underwear and linen, wall cupboard with ladies' clothing and worthless items. Room: lace curtain, drape, lamp, wooden double bed, bedside cabinet with cover, chair (2), runner (2). kitchen: ceiling lamp, table chair, gas ring (2), cooking pot, wall cupboard with ceramics. Residence: Reliefstraat 82, 2nd floor, Amsterdam, Holland. 1. ABRAHAM JAS, b. 10 November 1917, Amsterdam, Holland; d. 02 September 1941, Mauthausen-Gusen Concentration Camp, Mauthausen, Austria - Holocaust victim. 2. SALOMON JAS, b. 24 October 1924, Amsterdam, Holland; d. 26 December 1924, Amsterdam, Holland. 3. SARA JAS, b. 05 April 1926, Amsterdam, Holland; d. 30 September 1942, Auschwitz concentration camp, Oswiecim Poland – Holocaust victim. ESTHER JAS was born 05 October 1892 in Amsterdam, Holland, and died 15 December 1942 in Auschwitz concentration camp, Oswiecim Poland – Holocaust victim. She married MEIJER DE ZWARTE 03 February 1915 in Amsterdam, Holland, son of SALOMON DE ZWARTE and SAARTJE KLEERMAKER. He was born 30 March 1894 in Amsterdam, Holland, and died 15 December 1942 in Auschwitz concentration camp, Oswiecim Poland – Holocaust victim. 1. SARA DE ZWARTE, b. 01 April 1915, Amsterdam, Holland; d. 15 February 1943, Auschwitz concentration camp, Oswiecim Poland – Holocaust victim. KAREL JAS was born 29 June 1897 in Amsterdam, Holland, and died 16 July 1943 in Sobibor death camp, Poland - Holocaust victim. He married MIJNTJE BLEEKVELD 30 June 1920 in Amsterdam, Holland, daughter of HIJMAN BLEEKVELD and FLORA SCHELLEVISCH. She was born 14 February 1899 in Amsterdam, Holland, and died 16 July 1943 in Sobibor death camp, Poland - Holocaust victim. Resided with family February 1941: Retiefstraat 37 II, Amsterdam, Holland. Residence: Retiefstraat 37, 2nd floor, Amsterdam, Holland. 1. ABRAHAM JAS, b. 19 June 1921, Amsterdam, Holland; d. 22 January 1931, Amsterdam, Holland. 2. HIJMAN JAS, b. 22 May 1926, Amsterdam, Holland; d. 16 April 1943, Sobibor death camp, Poland - Holocaust victim. 3. FLORA JAS, b. 20 June 1929, Amsterdam, Holland; d. 16 July 1943, Sobibor death camp, Poland - Holocaust victim. 4. JUDITH JAS, b. 14 November 1931, Amsterdam, Holland; d. 16 July 1943, Sobibor death camp, Poland - Holocaust victim. 5. ABRAHAM JACOB JAS, b. 16 April 1937, Amsterdam, Holland; d. 16 July 1943, Sobibor death camp, Poland - Holocaust victim. NAATJE JAS was born 18 December 1899 in Amsterdam, Holland, and died 31 January 1944 in Auschwitz concentration camp, Oswiecim Poland – Holocaust victim. She married HARTOG ROEG, son of MOZES ROEG and MATJE GESLER. He was born 12 August 1897 in Amsterdam, Holland, and died 09 July 1943 in Sobibor death camp, Poland - Holocaust victim. Parents of HARTOG ROEG were: MOZES ROEG born 21 October 1870 in Amsterdam, Holland, and died 30 September 1924 in Amsterdam, Holland. He married MATJE GESLER 07 October 1896 in Amsterdam, Holland. She was born 02 February 1873 in Amsterdam, Holland, and died 15 April 1943 in Sobibor death camp, Poland - Holocaust victim. Resided, February 1941: Nieuwe Keizersgracht 25 II, Amsterdam, Holland. The Jokos file reveals that a claim was lodged for compensation for valuables surrendered to the Lippmann-Rosenthal looting bank (L-claim, number 4). Resided with family February 1941: Retiefstraat 63 II, Amsterdam, Holland. 1. PHILIP JACOB ROEG, b. 18 December 1924, Amsterdam, Holland; d. 28 May 1943, Sobibor death camp, Poland - Holocaust victim. Philip Jacob Roeg joined the HEDW (“Hortus – victory in unity”) football club in Amsterdam for the 1939-1940 season. 2. ABRAHAM ROEG, b. 26 December 1926, Amsterdam, Holland; d. 28 May 1943, Sobibor death camp, Poland - Holocaust victim. Occupation: Rag sorter - rag and bone man. TOBIAS JAS was born 20 November 1884 in Amsterdam, Holland. He married (1) HANNA VELLEMAN 07 June 1911 in Amsterdam, Holland, daughter of SALOMON VELLEMAN and LEENTJE PAIS. She was born 13 June 1887 in Amsterdam, Holland, and died 17 October 1926 in Amsterdam, Holland. He married (2) SARA ZWAAP 26 January 1927 in Amsterdam, Holland, daughter of SALOMON ZWAAP and CLARA VELLEMAN. She was born 27 September 1885 in Amsterdam, Holland, and died 15 December 1942 in Auschwitz concentration camp, Oswiecim Poland – Holocaust victim. Resided February 1941: Amstel 151 II, Amsterdam, Holland. ABRAHAM JAS was born 05 March 1886 in Amsterdam, Holland, and died 26 March 1943 in Sobibor death camp, Poland - Holocaust victim. He married (1) FIJTJE LIERENS 24 July 1907 in Amsterdam, Holland, daughter of JOSEPH LIERENS and ROOSJE VISMAN. She was born 17 July 1884 in Amsterdam, Holland, and died 24 May 1922 in Amsterdam, Holland. He married (2) ESTHER WILLING 01 November 1922 in Amsterdam, Holland, daughter of MOZES WILLING and CATHARINA OPPENHEIJM. She was born 06 February 1877 in Amsterdam, Holland, and died 26 March 1943 in Sobibor death camp, Poland - Holocaust victim. Resided with family February 1941: Tugelaweg 66 III, Amsterdam, Holland. 1. ROZETE JAS, b. 30 August 1911, Amsterdam, Holland; d. 11 June 1943, Sobibor death camp, Poland - Holocaust victim. 2. REBECCA JAS, b. 04 August 1912, Amsterdam, Holland; d. 17 September 1943, Auschwitz concentration camp, Poland - Holocaust victim. 3. JOËL JAS, b. 09 January 1917, Amsterdam, Holland; d. 31 March 1944, Auschwitz concentration camp, Poland - Holocaust victim; m. ANNA LESSING; b. 18 June 1915, Amsterdam, Holland; d. 19 October 1942, Auschwitz concentration camp, Poland - Holocaust victim. Resided with family February 1941: Burmanstraat 23 I, Amsterdam, Holland. 1. MICHEL WILLING, b. 17 November 1911, Amsterdam, Holland; d. 30 April 1943, Auschwitz concentration camp, Poland - Holocaust victim. CLARA JAS was born 03 December 1887 in Amsterdam, Holland, and died 1936 in Amsterdam, Holland. She married JOCHEM VAN CLEEF 21 November 1906 in Amsterdam, Holland, son of MEIJER VAN CLEEF and SAARTJE KLOOT. He was born 20 January 1883 in Amsterdam, Holland, and died 28 July 1943 in Sobibor death camp, Poland - Holocaust victim. Joachem van Cleef was a son of Meijer van Cleef and Saartje Kloot. He married Clara Jas in 1906. She was the daughter of Joël Jas and Rosette Scharlewie. The couple had six children: Joël, Isaac (who died at a young age), Emanuel, Celina and two children who survived the war. After Clara Jas had died in 1936, Joachem van Cleef married Vogeltje Spreekmeester. She was a daughter of Eliazar Spreekmeester and Rebecca Baruch. 1. MEIJER VAN CLEEF, b. 28 January 1907, Amsterdam, Holland; m. MARIA CLASINA CROUSE, 26 April 1934, Amsterdam, Holland; b. 29 September 1907, Amsterdam, Holland. 2. JOEL VAN CLEEF, b. 14 July 1909, Amsterdam, Holland; d. 30 September 1942, Auschwitz concentration camp, Poland - Holocaust victim. 3. SALOMON VAN CLEEF, b. 28 July 1911, Amsterdam, Holland; d. 19 November 1943, Auschwitz concentration camp, Poland - Holocaust victim. 4. ISAAC VAN CLEEF, b. 29 December 1912, Amsterdam, Holland. 5. EMANUEL VAN CLEEF, b. 08 July 1914, Amsterdam, Holland; d. 23 April 1943, Sobibor death camp, Poland - Holocaust victim. 6. CELINE VAN CLEEF, b. 31 July 1921, Amsterdam, Holland; d. 16 July 1943, Sobibor death camp, Poland - Holocaust victim; m. LOUIS HAKKER; b. 14 December 1921, Amsterdam, Holland; d. 16 July 1943, Sobibor death camp, Poland - Holocaust victim. Celina van Cleef, also known as Lien, was a daughter of Jochem van Cleef and Clara Jas. In the 1940's she married Louis Hakker, also known as Lowie. Louis still lived with his parents. MOZES JAS was born 12 June 1890 in Amsterdam, Holland, and died 19 November 1942 in Auschwitz concentration camp, Poland - Holocaust victim. He married MIETJE VAN HES 12 December 1919 in Amsterdam, Holland, daughter of LIEPMAN VAN HES and LEENTJE SMEER. She was born 09 February 1895 in Amsterdam, Holland, and died 19 November 1942 in Auschwitz concentration camp, Poland - Holocaust victim. Parents of MIETJE VAN HES were: LIEPMAN VAN HES born 09 July 1869 in Amsterdam, Holland, and died 29 November 1934 in Amsterdam, Holland. He married LEENTJE SMEER 14 August 1889 in Amsterdam, Holland. She was born 04 February 1870 in Amsterdam, Holland, and died 20 March 1943 in Sobibor death camp, Poland - Holocaust victim. Resided with family February 1941: Blasiusstraat 30 huis, Amsterdam, Holland. Occupation: Grocery firm branch manager. According to a list with shops of Jewish owners, compiled by the Amsterdam police in 1940, this family had a grocery store, address: Blasiusstraat 30 in Amsterdam, Holland. 1. JOEL JAS, b. 14 August 1924, Amsterdam, Holland; d. 30 September 1942, Auschwitz concentration camp, Poland - Holocaust victim. LEENTJE JAS was born 09 September 1892 in Amsterdam, Holland, and died 22 March 1970 in Amsterdam, Holland. She married JOSEPH COHEN 22 March 1916 in Amsterdam, Holland, son of HARTOG COHEN and FROUKE MEIJER. He was born 21 July 1890 in Groningen, Holland, and died 03 December 1948 in Amsterdam, Holland. 1. FROUKJE COHEN, b. 26 February 1917, Amsterdam, Holland; d. 24 May 1945, Malmö, Sweden; m. ISAAC SIMON VAN LEER, 06 August 1942; b. 13 August 1915, Amsterdam, Holland; d. 25 April 1945, Camp Wüstegiersdorf, Low Silesia, Germany - Holocaust victim. The codename “AL Riese”, served as a cover for a system of concentration camps subordinated to KL Gross- Rosen which were located in the massif of Eulengebierge (Sowie Mountains) and had a common administration and headquarters with its seat in the camp Wüstegiersdorf. AL Riese, which consisted of 13 camps and a camp hospital was established in connection with building another quarters for Adolf Hitler. AL Riese consisted of about 13 000 prisoners. They were all Jews from many European countries but the largest number of them was from Hungary and Poland. Estimated number of the dead is 5 000 people. Resided with family December 1942: Bovenbrugstraat 26, Arnhem, Holland. 2. ROSETTE COHEN, b. 01 December 1920, Amsterdam, Holland; d. 01 September 1942, Auschwitz concentration camp, Poland - Holocaust victim. ABRAHAM JAS was born 02 November 1907 in Amsterdam, Holland, and died 23 July 1943 in Sobibor death camp, Poland - Holocaust victim. He married ALIDA ZWALF 13 June 1935 in Amsterdam, Holland, daughter of HARTOG ZWALF and MARIANNE MORPURGO. She was born 17 June 1910 in Amsterdam, Holland, and died 23 July 1943 in Sobibor death camp, Poland - Holocaust victim. Parents of ALIDA ZWALF were: HARTOG ZWALF born 13 May 1879 in Amsterdam, Holland, and died June 1928 in Amsterdam, Holland. He married (1) ALIDA MORPURGO 17 October 1900 in Amsterdam, Holland. She was born 20 June 1880 in Amsterdam, Holland. He married (2) MARIANNE MORPURGO 21 April 1909 in Amsterdam, Holland. She was born 01 July 1887 in Amsterdam, Holland, and died 26 January 1943 in Auschwitz concentration camp, Poland - Holocaust victim. 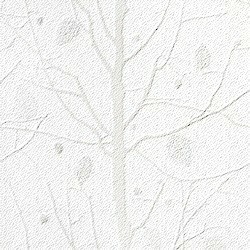 Resided with family: Havenstraat 2 d, Hilversum, Holland. 1. SONJA MARIANNE JAS, b. 22 April 1937, Amsterdam, Holland; d. 23 July 1943, Sobibor death camp, Poland - Holocaust victim. ISAAC JAS was born 29 March 1910 in Amsterdam, Holland, and died 31 May 1944 in Auschwitz concentration camp, Poland - Holocaust victim. He married REBECCA JAS, daughter of ABRAHAM JAS and FIJTJE LIERENS. She was born 04 August 1912 in Amsterdam, Holland, and died 17 September 1943 in Auschwitz concentration camp, Poland - Holocaust victim. 1. SOPHIA JAS, b. 30 October 1940, Amsterdam, Holland; d. 12 August 1943, Westerbork transit camp, Drenthe, Holland – Holocaust victim. Sophia Jas died on 12 August 1943 in Westerbork transit camp and she was cremated on 16 August 1943. The urn with her ashes was placed on the Jewish cemetry in Diemen on field U, row 11, grave nr. 12. JOSEPH JAS was born 30 April 1912 in Amsterdam, Holland, and died 29 April 1945 in Bergen-Belsen concentration camp, Germany. He married ESTHER ENGELSMAN 05 June 1940 in Amsterdam, Holland, daughter of DAVID ENGELSMAN and NAATJE PRESSER. She was born 22 October 1916 in Amsterdam, Holland, and died 11 June 1943 in Sobibor death camp, Poland - Holocaust victim. 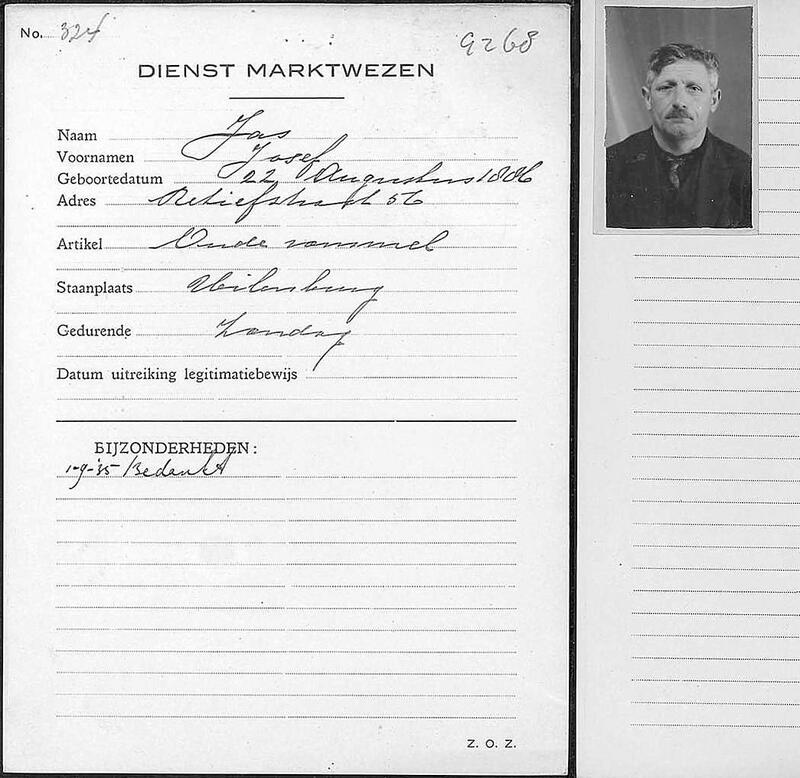 Parents of ESTHER ENGELSMAN were: DAVID ENGELSMAN born 27 January 1874 in Amsterdam, Holland, and died 26 March 1943 in Sobibor death camp, Poland - Holocaust victim. He married (1) ELIZABETH RAPHAEL FRANK 22 February 1899 in Amsterdam, Holland. She was born 02 February 1871 in Amsterdam, Holland. He married (2) NAATJE PRESSER 29 August 1906 in Amsterdam, Holland. She was born 17 August 1888 in Amsterdam, Holland, and died 26 March 1943 in Sobibor death camp, Poland - Holocaust victim. Resided February 1941: Reitzstraat 38 III, Amsterdam, Holland. Esther Engelsman worked as a cutter with the lingerie and ready-made clothing company SIDVA (Simon de Vries Ateliers), Amsterdam in October 1941. She had been in office for eleven years. 1. JOËL JAS, b. 26 November 1942, Amsterdam, Holland; d. 11 June 1943, Sobibor death camp, Poland - Holocaust victim. 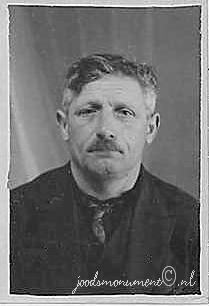 Joël Jas was deported to Sobibor in June 1943 from Vught via Westerbork on the so-called children's transport. He was 6 months old when he died. BENJAMIN GOUDEKETTING was born 20 January 1911 in Amsterdam, Holland, and died 02 April 1943 in Sobibor death camp, Poland - Holocaust victim. He met (1) BERTHA VAN CLEEF. She was born 03 February 1916 in Zandvoort, Holland, and died 19 November 1943 in Auschwitz concentration camp, Oswiecim Poland – Holocaust victim. He married (2) SARA DA COSTA 07 April 1938 in Amsterdam, Holland. She was born 07 December 1913 in Zandvoort, Holland, and died 02 April 1943 in Sobibor death camp, Poland - Holocaust victim. Resided February 1941: Laing's Nekstraat 23 II, Amsterdam, Holland. 1. RUDOLF ALEXANDER GOUDEKETTING, b. 30 May 1939, Amsterdam, Holland; d. 02 April 1943, Sobibor death camp, Poland - Holocaust victim. ABRAHAM GOUDEKETTING was born 19 March 1915 in Amsterdam, Holland, and died 31 January 1944 in Auschwitz concentration camp, Oswiecim Poland – Holocaust victim. He married SARAH VISSER 28 February 1940 in Amsterdam, Holland, daughter of BENJAMIN VISSER and ANNAATJE VERDUIN. She was born 28 May 1915 in Amsterdam, Holland, and died 31 January 1944 in Auschwitz concentration camp, Oswiecim Poland – Holocaust victim. Resided with family, February 1941: Commelinstraat 15 II, Amsterdam, Holland. Residence: Commelinstraat 15, 2nd floor, Amsterdam, Holland. Parents of Sarah Visser were BENJAMIN VISSER born 31 July 1885 in Amsterdam, Holland, and died 03 December 1942 in Auschwitz concentration camp, Oswiecim Poland – Holocaust victim. He married ANNAATJE VERDUIN 09 September 1908 in Amsterdam, Holland, daughter of MEIJER VERDUIN and SOPHIA HANOUWER. She was born 20 February 1886 in Amsterdam, Holland, and died 09 April 1943 in Sobibor death camp, Poland - Holocaust victim. Occupation: Rag and bone man (totter, junk dealer). Residence: Jodenbreestraat 51, Amsterdam, Holland. SARA DE ZWARTE was born 01 April 1915 in Amsterdam, Holland, and died 15 February 1943 in Auschwitz concentration camp, Oswiecim Poland – Holocaust victim. She married LOUIS KOSTER 26 October 1938 in Amsterdam, Holland, son of JUDA KOSTER and MIETJE ZILVERBERG. He was born 14 February 1913 in Altona, Germany, and died 02 May 1945 in Municipality unknown, Germany. Parents of LOUIS KOSTER were: JUDA KOSTER born 28 December 1885 in Amsterdam, Holland, and died 22 October 1944 in Auschwitz concentration camp, Oswiecim Poland – Holocaust victim. He married MIETJE ZILVERBERG 26 May 1908 in Emmen, Holland. She was born 09 January 1883 in Amsterdam, Holland, and died 07 December 1942 in Auschwitz concentration camp, Oswiecim Poland – Holocaust victim. Resided with family: Waverstraat 95 I, Amsterdam, Holland. Occupation: Office clerk, sales representative. 1. MIA KOSTER, b. 15 November 1941, Amsterdam, Holland; d. 19 February 1943, Auschwitz concentration camp, Oswiecim Poland – Holocaust victim. 2. MEIJER KOSTER, b. 18 November 1942, Westerbork transit camp, Drenthe, Holland; d. 19 February 1943, Auschwitz concentration camp, Oswiecim Poland – Holocaust victim. Westerbork was a World War II Nazi refugee, detention and transit camp in Hooghalen, ten kilometres north of Westerbork, in the northeastern Netherlands. Its function during the Second World War was to assemble Roma and Dutch Jews for transport to other Nazi concentration camps. On 15 December 1938, the Dutch government closed its border to refugees. From then on refugees would not have any statutory rights. In 1939, the Dutch government erected a refugee camp, Centraal Vluchtelingenkamp Westerbork, financed, ironically, partly by Dutch Jewry, in order to absorb fleeing Jews from Nazi Germany. The Jewish refugees were housed after they had tried in vain to escape Nazi terror in their homeland. During World War II, the Nazis took over the camp and turned it into a deportation camp. From this camp, 101,000 Dutch Jews and about 5,000 German Jews were deported to their deaths in Occupied Poland. In addition, there were about 400 Gypsies in the camp and at the very end of the War, some 400 women from the resistance movement. Hartog Koperberg was the son of Leon Koperberg and Marianne Ricardo. He was first married to Sophia de Beer. They were later divorced. In October 1940 Hartog Koperberg married Rosette Jas. Her son from a previous relationship, Hans Jas, was taken into the family. ROZET JAS was born 30 August 1911 in Amsterdam, Holland, and died 11 June 1943 in Sobibor death camp, Poland - Holocaust victim. She married BENJAMIN LESSING 03 April 1935 in Amsterdam, Holland, son of ISAAC LESSING and CATHARINA DU MOSCH. He was born 07 April 1909 in Amsterdam, Holland, and died 08 January 1944 in Auschwitz concentration camp, Poland - Holocaust victim. Parents of BENJAMIN LESSING were: ISAAC LESSING born 08 June 1885 in Amsterdam, Holland, and died 26 October 1942 in Auschwitz concentration camp, Poland - Holocaust victim. He married CATHARINA DU MOSCH 25 April 1906 in Amsterdam, Holland. She was born 21 May 1883 in Amsterdam, Holland, and died 26 October 1942 in Auschwitz concentration camp, Poland - Holocaust victim. Resided February 1941: Bredeweg 17 huis, Amsterdam, Holland. The Jokos file reveals that a claim was lodged for compensation for valuables surrendered to the Lippmann-Rosenthal looting bank (L-claim, number 7309/22523). Resided with family February 1941: Tugelaweg 65 II, Amsterdam, Holland. 1. SOPHIA LESSING, b. 27 February 1936, Amsterdam, Holland; d. 11 June 1943, Sobibor death camp, Poland - Holocaust victim. Sophia Lessing was deported to Sobibor in June 1943 from Vught via Westerbork on the so-called children's transport. She was 7 when she died. 2. CATHARINA LESSING, b. 09 September 1939, Amsterdam, Holland; d. 11 June 1943, Sobibor death camp, Poland - Holocaust victim. Catharina Lessing was deported to Sobibor in June 1943 from Vught via Westerbork on the so-called children's transport. She was 3 when she died. REBECCA JAS was born 04 August 1912 in Amsterdam, Holland, and died 17 September 1943 in Auschwitz concentration camp, Poland - Holocaust victim. She married ISAAC JAS, son of JACOB JAS and SAARTJE COHEN. He was born 29 March 1910 in Amsterdam, Holland, and died 31 May 1944 in Auschwitz concentration camp, Poland - Holocaust victim. MICHEL WILLING was born 17 November 1911 in Amsterdam, Holland, and died 30 April 1943 in Auschwitz concentration camp, Poland - Holocaust victim. He married SARA GROEN 22 May 1940 in Amsterdam, Holland, daughter of JUDA GROEN and DINA LAKMAKER. She was born 12 October 1907 in Amsterdam, Holland, and died 19 February 1943 in Auschwitz concentration camp, Poland - Holocaust victim. Parents of SARA GROEN were JUDA GROEN born 24 September 1873 in Amsterdam, Holland, and died 21 September 1942 in Auschwitz concentration camp, Poland - Holocaust victim. He married DINA LAKMAKER 06 July 1898 in Amsterdam, Holland. She was born 02 November 1874 in Amsterdam, Holland, and died 24 September 1942 in Auschwitz concentration camp, Poland - Holocaust victim. Resided February 1941: Camperstraat 68 I, Amsterdam, Holland. Resided February 1941: Vrolikstraat 64 III, Amsterdam, Holland. 1. ABRAHAM WILLING, b. 08 September 1941, Amsterdam, Holland; d. 19 February 1943, Auschwitz concentration camp, Poland - Holocaust victim. MEIJER VAN CLEEF was born 28 January 1907 in Amsterdam, Holland, and died 21 January 1968 in Meppel, Drenthe, Holland. 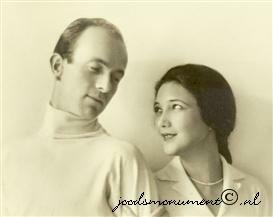 He married MARIA CLASINA CROUSE 26 April 1934 in Amsterdam, Holland, daughter of JAN CROUSE and JANNETJE HORSMAN. She was born 29 September 1907 in Amsterdam, Holland, and died 25 January 1999 in Amstelveen, Amsterdam, Holland. 2. HANS VAN CLEEF, b. 19 November 1942, Amsterdam, Holland; d. 26 April 1957, Amsterdam, Holland. 3. EMANUEL JAN SAMUEL VAN CLEEF. JOEL VAN CLEEF was born 14 July 1909 in Amsterdam, Holland, and died 30 September 1942 in Auschwitz concentration camp, Poland - Holocaust victim. He married MIRJAM SPREEKMEESTER 25 March 1938 in Amsterdam, Holland, daughter of ELIAZER SPREEKMEESTER and REBECCA BARUCH. She was born 29 July 1903 in Amsterdam, Holland, and died 23 July 1942 in Auschwitz concentration camp, Poland - Holocaust victim. Resided with family February 1941: Afrikanerplein 18 huis, Amsterdam, Holland. 1. EDDY VAN CLEEF, b. 11 April 1939, Amsterdam, Holland; d. 23 July 1942, Auschwitz concentration camp, Poland - Holocaust victim. 2. JOCHEM VAN CLEEF, b. 11 April 1939, Amsterdam, Holland; d. 23 July 1942, Auschwitz concentration camp, Poland - Holocaust victim. Resided with family, February 1941: Uiterwaardenstraat 79 huis, Amsterdam, Holland. Parents of Sara Vleesdraager were MOZES VLEESDRAAGER born 18 December 1875 in Amsterdam, Holland, and died 30 September 1942 in Auschwitz concentration camp, Poland - Holocaust victim. He married LEENTJE BLITZ 10 January 1900 in Amsterdam, Holland. She was born 09 December 1878 in Amsterdam, Holland, and died 16 July 1943 in Sobibor death camp, Poland - Holocaust victim. Resided with family, February 1941: Reitzstraat 17 huis, Amsterdam, Holland. EMANUEL VAN CLEEF was born 08 July 1914 in Amsterdam, Holland, and died 23 April 1943 in Sobibor death camp, Poland - Holocaust victim. He married DINA SWART 18 December 1940 in Amsterdam, Holland, daughter of MARCUS SWART and BETJE VAN BEEZEM. She was born 16 December 1913 in Amsterdam, Holland, and died 23 April 1943 in Sobibor death camp, Poland - Holocaust victim. Resided with family February 1943: Cilliersstraat 7 I, Amsterdam, Holland. Parents of Dina Swart were MARCUS SWART born 01 March 1878 in Amsterdam, Holland, and died 05 October 1942 in Auschwitz concentration camp, Poland - Holocaust victim. He married BETJE VAN BEEZEM 17 January 1900 in Amsterdam, Holland. She was born 11 November 1880 in Amsterdam, Holland, and died 05 October 1942 in Auschwitz concentration camp, Poland - Holocaust victim. Resided with family, February 1941: Christiaan de Wetstraat 14 huis, Amsterdam, Holland. Marcus Swart and his family, Amsterdam. Marcus Swart, son of Gabriel Swart and Sara Peper, married Betje van Beezem, daughter of Hartog van Beezem and Margaretha Degen, on 17 January 1900. The couple had eight children: Gabriel, Sara, Margaretha (deceased in 1934), Mathilda, Hartog, Dina, Frouwke and Abraham. The family lived at several addresses in Amsterdam, Holland, including at 8 Benviljoenstraat and 14 Christiaan de Wetstraat. Marcus Swart was a market vendor. He had a stand on the Groentenmarkt [vegetable market]. 1. CLARA VAN CLEEF, b. 13 January 1943, Amsterdam, Holland; d. 23 April 1943, Sobibor death camp, Poland - Holocaust victim.